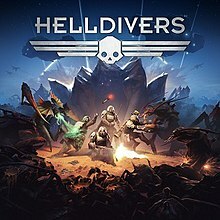 Helldivers is a top-down shooter game developed by Arrowhead Game Studios and published by Sony Computer Entertainment. The game was released for the PlayStation 3, PlayStation 4 and PlayStation Vita with cross-play, on March 3, 2015 in North America and on March 4, 2015 in Europe, respectively. A version for Microsoft Windows was also released via Steam on December 7, 2015. It features couch or online co-op, or a combination of both, for up to four players. Helldivers takes inspiration from military science fiction such as Aliens and Starship Troopers. While solo play is possible, the intent is for two to four players to cooperate on missions to enemy-controlled planets. Almost every weapon or tool accessible to players can hurt their teammates, making discipline and coordination paramount. To win, players must fight or sneak through enemy-controlled territory, complete objectives, and call a dropship to extract them from the planet. Outside of certain trophies/achievements, there are no rewards granted for simply killing enemies, which are endless. It is possible to hold out indefinitely against waves of defenders, calling in more and more ammunition and defenses and racking up huge kill counts, without making the slightest progress toward winning the mission. When the game was shown during Gamescom 2013 the game's difficulty included three levels: Challenging, Hard, or "Hell Dive". The build presented at E3 2014 and Gamescom 2014 however indicated there to be more than nine difficulties, depending on which planet the player chose. The final game does indeed feature one global difficulty level within which the player can choose an easy or hard planet. Once on the planet's surface, players follow an escalating pattern. Weak enemy patrols crisscross the planet semi-randomly, keeping watch on objectives. Players can see nearby patrols on the radar, try to avoid them, or kill them before discovery. If they spot the player, they will quickly sound an alarm, calling in front-line troops to fight the players and interfere with completing objectives. Endless troops can pour in forever if the players continue to set off alerts. If the player can kill or escape from the responders without new alarms going off, the map will quiet down, giving players an opportunity to advance without resistance until the next alarm goes off. When all objectives are completed or failed, the players call the dropship. It takes 90 seconds to arrive, and during that time, hostiles are strongly attracted to the landing zone for a final fight. Entering the dropship completes the mission. As with Arrowhead Game Studios's previous title Magicka friendly fire, the ability to harm teammates, is always on, and there is no way to disable the feature. Not only can players' personal weapons harm teammates, but so can air support and turrets they deploy. Players' thoughtlessly deployed vehicles and supply drops can also crush themselves or teammates. This requires the players to carefully plan their actions during the game's many chaotic combat sequences. There are ways to work around friendly fire: some weapons can launch over teammates' heads, and some turrets can be upgraded to stop shooting when players enter the line of fire. But player skill is still the main solution. The opportunity for teamwork is also present in other areas. Teammates can be helped up if downed, healed if injured, resupplied if out of ammo. Several heavy weapons come with a backpack that allows a second player to help reload; there are also ammo packs for carrying normal magazines and grenades for the group to access. Players use the Reinforce strategem to call in respawns for killed teammates. While online, an SOS beacon is available to invite random players to join a mission in progress, although games can also be set to private. The dystopian universe of Helldivers has mankind ruled by a 'managed democracy', an improvement of contemporary democracy where the outcome of elections are more predictable. The improved democracy has become more than a way of electing a government, it has become a creed by which the brainwashed inhabitants of Super Earth fight for - without fully acknowledging what it means. Super Earth, the fictional futuristic Earth is beset on all sides by three hostile enemy races (the Bugs, the Cyborgs and the Illuminates) that, according to the government, in one way or another needs to be subdued. And while the Helldivers are a pure combat unit, they are often tasked with retrieving technology, activating oil-pumps or other activity that is deemed important by the government to preserve freedom and the Earth 'way of life'. The game received generally favourable reviews from critics. It currently holds 84% on Metacritic. IGN played the demo version of Helldivers at the 2013 Gamescom, and reviewed the demo positively. Game Informer also gave the demo a positive rating, commenting that it "isn't easy, but this throwback to classic top down shooters is still a good time." GameSpot's reviewer Cameron Woolsey gave the game an 8/10. He noted that the game has "fantastic cooperative action" but "missions and story are lacking." IGN awarded it 9.0 out of 10, saying "Brutal, focused, and mechanically rich, Helldivers is one of the best co-op action experiences you can have." At face value one when I saw the video for this, it looked like it was just a twin stick shooter. I expected something extremely dumb but kind of fun, and what you get is kind of a lot deeper. I thought it was going to be a shoot'em-up, it's more of a strategy based-... It's a it's a stratem-up! A "strate-shmup". Because it's not just shoot at things and dodge bullets, there's more to it than that. Helldivers was nominated for "Best Action" and won "Best Handheld Game of the Year" at the 2016 D.I.C.E. Awards held by Academy of Interactive Arts & Sciences. ^ Hedström, Malin (February 13, 2015). "War declared! Helldivers do battle on PS4, PS3 and PS Vita next month". PlayStation Blog US. Retrieved April 7, 2015. ^ Hedström, Malin (February 13, 2015). "Prepare for War: Helldivers Launches March 3rd". PlayStation Blog US. Retrieved April 7, 2015. ^ Matulef, Jeffery (November 6, 2015). "Helldivers is coming to Steam next month". Eurogamer. Retrieved November 7, 2015. ^ "Magicka devs launching Helldivers for PS3, PS4 and PS Vita". Polygon. Retrieved 26 January 2014. ^ "Helldivers coming to PS3, PS4 and PS Vita, with cross-play over all formats". VG 24/7. Retrieved 26 January 2014. ^ a b "Gamescom: In Helldivers, You Probably Won't Survive". IGN. Retrieved 26 January 2014. ^ "Helldivers: Enter into intergalactic warfare utilizing overpowered weapons and stratagems to defeat the enemies of mankind". Retrieved 24 October 2014. ^ "Helldivers (PC) at Metacritic". Metacritic. Retrieved February 27, 2016. ^ "Helldivers (PS4) at Metacritic". Metacritic. Retrieved February 27, 2016. ^ "Helldivers". Metacritic. Retrieved 2016-02-23. ^ Reeves, Ben. "Zapping Alien Bugs In Arrowhead Studios Helldivers". Game Informer. Retrieved 26 January 2014. ^ Woolsey, Cameron. "Helldivers Review". Gamespot. Retrieved 3 March 2015. ^ "Previously Recorded: Helldivers (TV Episode 2016) - IMDb". Retrieved 2017-12-06. ^ "Academy Membership Honors 19th D.I.C.E. Awards Winners" (PDF). Retrieved 2016-02-24. This page was last edited on 15 April 2019, at 01:26 (UTC).